Where you live could determine how you die. 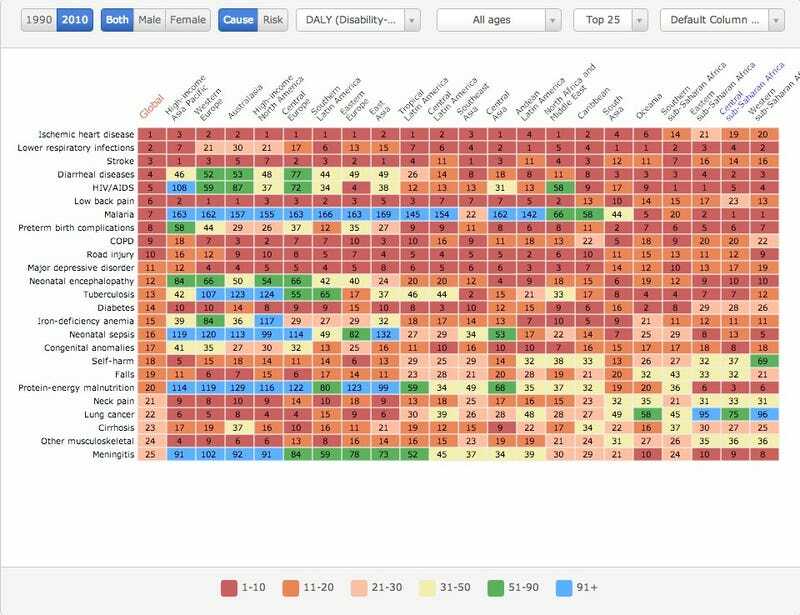 This week, The Lancet published results of the Global Burden of Disease Study 2010, a massive effort funded by the Bill and Melinda Gates Foundation, to determine what the leading causes of death are in every part of the globe. In a series of incredibly fascinating interactive infographics on IHME, you can see how data from 2010 compare with data from 1990. There is a lot of good news, though many areas are still struggling, especially in regions of Africa. Above you can see leading causes of death in various regions from 2010, and compare it to 1990 below (click to enlarge). Chronic diseases such as heart disease, cancer and diabetes have taken the place of infectious diseases and malnutrition-related childhood illnesses as the primary cause of death worldwide . . . And while life expectancy has increased worldwide . . . longer lives are coupled with disability, mostly caused by the increasing incidence of chronic disease, musculoskeletal disorders and mental health conditions . . . The study also reveals that high blood pressure is the world's leading cause of mortality and disability - a problem affecting poorer countries as well as the more affluent, because of a surge in high-salt diets across the developing world. And while tobacco smoking is falling in the developed world, it is rising in poorer countries. Amid the more alarming data, there is some good news: child mortality has decreased globally, from 11.9 million in 1990 to 7.7 million in 2010, and child malnutrition has fallen. The burden of disease from unsafe water and sanitation is also down on previous years. But while the study demonstrates progress in some important global health areas, it also underlines that much remains to be done. For example, 100 children every hour continue to die from vaccine-preventable infections, such as rotavirus, meningitis and hepatitis B. And preventing death among young adults, particularly men, needs urgent attention: the number of men dying because of violence, injuries, suicide and HIV/AIDS is escalating. AIDS alone remains a leading cause of disease burden and death, despite fewer new infections and the increasing availability of antiretroviral therapy, care and support. Learn more about the study on The Lancet, and look at more data at IHME.